What is our clock worth to you? To the community, it is priceless. As an instrument from a long-ago era, made by one of the nation’s most prestigious clock makers and an acclaimed bell maker of the period, it is highly prized. There are only a few like it in the country. When Charles H. Haynes ordered it in 1920 from the E. Howard company of Boston to hang in the tower of the building honoring his father, he spared no expense. He wanted the best—and he got it. And while he lived it received the best of care. In later years, not so much. In 1992 the clock underwent a major overhaul. It is past time for another one, and the cost will be in the thousands of dollars. We are raising the funds not only for this necessary restoration, but for proper maintenance of the clock well into the future. Good news: Rutherford County Commissioners on July 28 approved the 2010 budget, which included $3,500 to be spent restoring our clock. This is about half the amount needed for the initial restoration stage. The other half, and a cushion for future maintenance, is up to us.When the Haynes Memorial Building was torn down in the 1970’s, fortunately the clock was saved. It was tucked away in a warehouse for a couple of years, with no firm plan for its future use. Only at the urging of the community leaders and members of the Haynes family did Cone Mills build the tower in which the clock now resides. When Cone went bankrupt in 2004 it sold the tower and the acre around it to Rutherford County. In this time of budget cuts for critical government programs like health care, education and public safety, the needs of an old clock is way at the bottom of the County’s priorities. Our beloved clock and its tower could last another ninety years or even longer, but only if properly cared for. The Society intends to provide that care, with or without financial assistance from the county. But we must have your help to do it. The clock – standing proudly over the town in the 1920s. Our clock is not exactly one of a kind, but very close. Called a “tower clock” for obvious reasons, it was made in 1920 by E. Howard and Company. Founded in 1842, Howard was the premier tower clock manufacturer in this country. Their tower clocks were always made to order, and the parts of each were hand fitted. 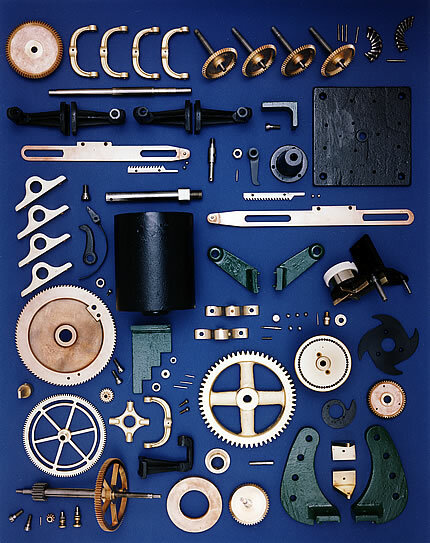 All the gears, bushings, etc. were stamped with the last number of the clock’s serial number (ours is #3578). 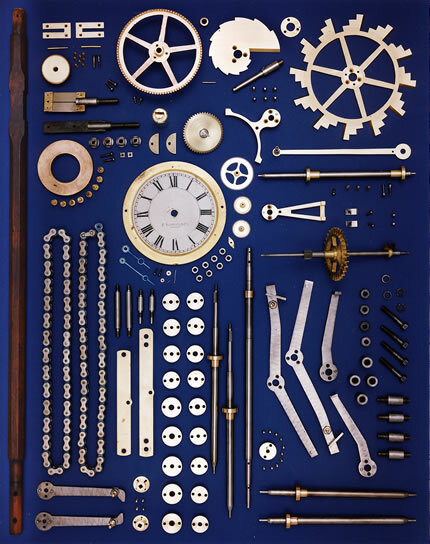 In other words, the main frame, and its associated parts were not interchangeable with another clock’s. This type represents only 10-15% of all those made by Howard. That’s one reason they are so valuable and rare. Ours is a “quarter chiming” clock, one that chimes each quarter-hour. 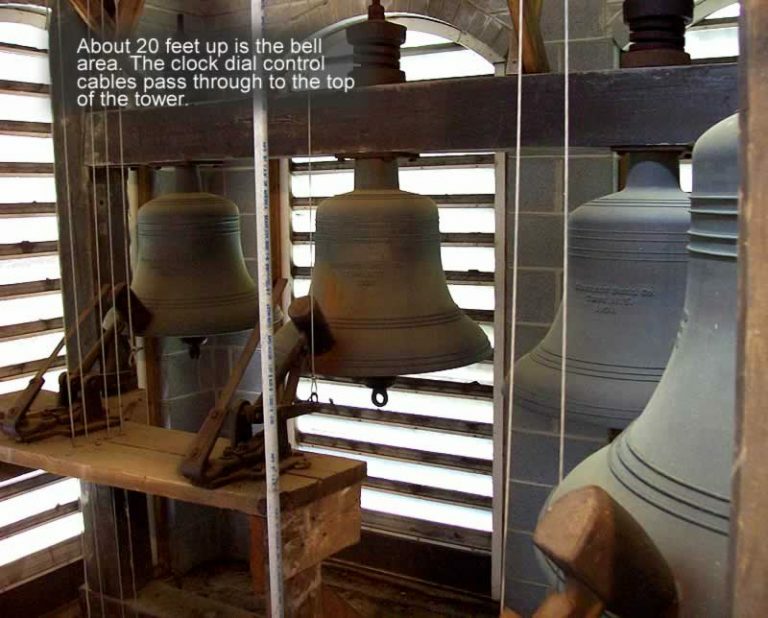 It features the “Westminster chimes,” the melody that peals from London’s famous Big Ben. The four bronze-copper bells, cast at the Meneely foundry in Troy, New York, were the very finest available. Meneely went out of business long ago, but their bells still ring across the land. 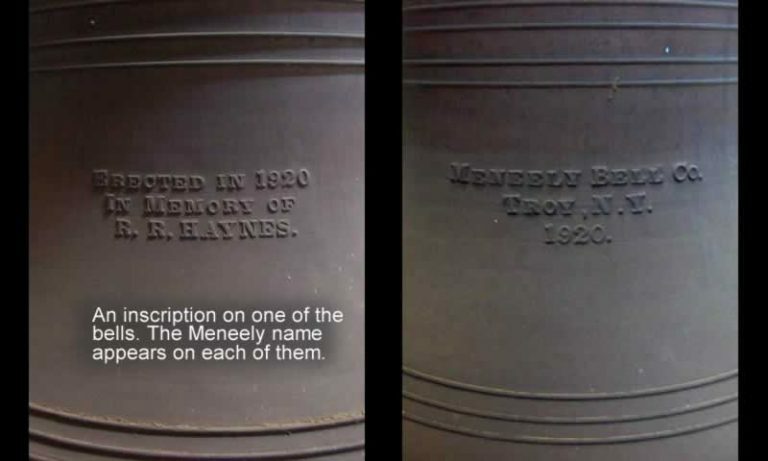 Since 1860 the Meneely name was embossed on over 65,000 bells. In the Maneely scale, a bell’s size (the diameter of its mouth), dictates its weight. Each of ours measures about 38 inches and weighs in the neighborhood of 1,000 pounds. With proper care a clock such as ours should run 50, 60 or perhaps 70 years, and so it did, more or less. With time out in 1976 for its old tower to be demolished and a new one built, it kept good time until 1992. Finally, worn and tired, it ground to a halt. A three-month $10,000 restoration process ensued. 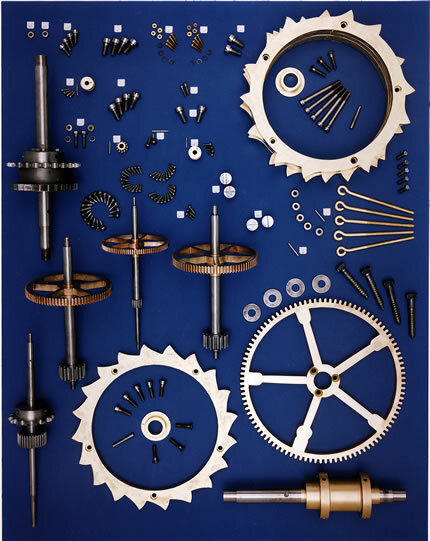 Its gears, wheels, chains, levers, spindles, shims, screws and fittings were cleaned, rebuilt and reassembled. And so it chimed for another 18 years, hanging on like Cliffside itself. Now, once again, its works have seized up, no longer functioning. Like all stopped clocks it’s only “right” twice a day. That’s not good enough for Cliffside. It’s more than the sum of its parts. 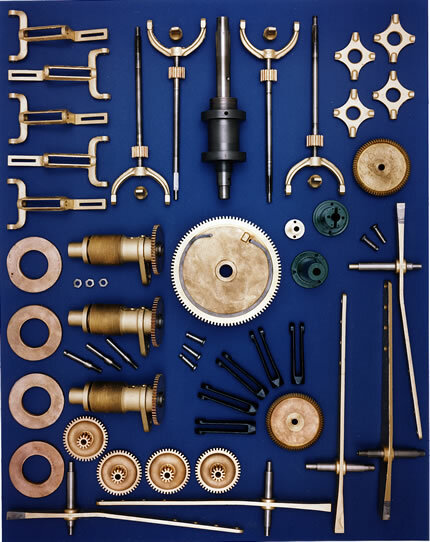 Here are our clock’s smaller components, photographed by Charlotte clockmaker Jim VanOrsdel, who restored it in 1992. They are laid out prior to reassembly. Those who’ve known and loved it well over the years believe that if it could speak, it would say, that it longs to be an active part of the community once again. 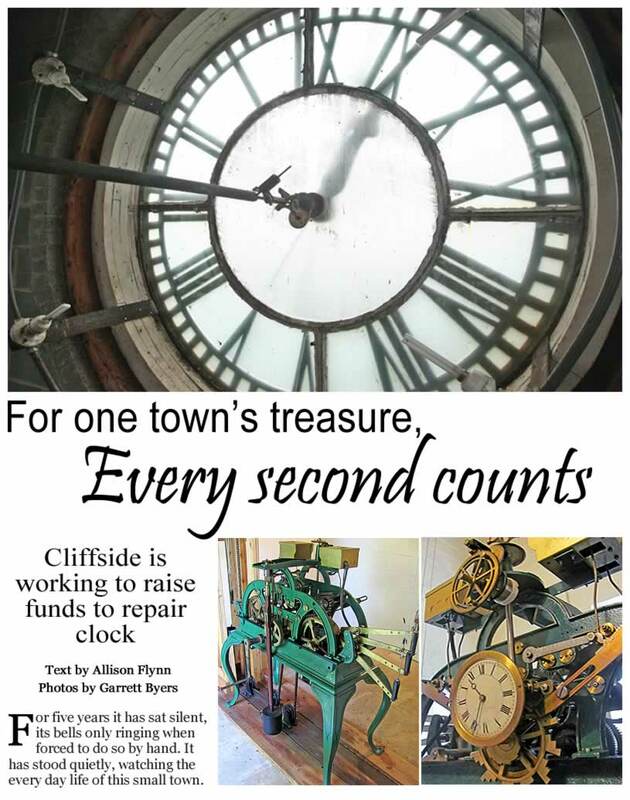 And funding for much needed repairs could allow the Cliffside Clock to return to its former glory. Affectionately named Raleigh—after Cliffside founder Raleigh Rutherford Haynes—the town clock, in the words of Cliffside Historical Society President Philip White, is sick. In a nutshell, the clock is out of time and needs to be repaired. 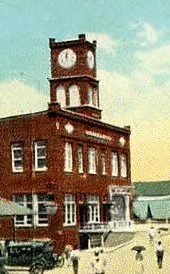 Because the clock is located on land owned by the county, the society recently approached Rutherford County Commissioners about going in together, each paying half, to repair the clock. The estimated repairs would be around $7,000, White said. A decision as to whether they’ll be able to help with repair costs hasn’t yet been made by the commissioners, White said, and in the meantime, the society is working to raise private funding. Until the money is available, the clock’s face will remain expressionless, its internal workings motionless. The clock has served as the town’s timepiece since its erection in the R.R. Haynes Memorial Building in 1922. Dedicated on June 24 of that year, the building served as a memorial to textile magnate and town founder Raleigh Rutherford Haynes. “It was built to memorialize his foresight and contributions to the town,” White said. The building served as a home to all kinds of activities. At one point the small town, which was also home to Haynes’ textile mill, Cliffside Mills, also had a movie theater, bowling alley and various shops and stores. Above, the quarter striking clock is out of time and in need of repair. The Westminster chime was built by E. Howard Tower Clocks in the early 1900s. A smaller face is on the workings of the clock, allowing the person who is winding it to check to make sure the time is accurate. Below right, the clock tower stands at 40 feet and each of the dials are five feet across. In the early days, employees of Cliffside Mills lived in homes in the mill village. But in the 1960s, after Cliffside Mills became a part of Cone Mills Corporation, the decision was made to do away with the rule and the mill houses were destroyed. “As the other houses were being removed, there was a great sentiment to save the Haynes House,” White Said. Haynes’ home sat on Haynes’ Hill, located on the town’s main street just down from the mill. However, the decision was made to destroy the home and the memorial building – leaving question as to what to do with the town clock. Using bricks and woodwork from the memorial building, Cone Mills’ corporate office decided the clock would be moved to its own tower, which was erected on the former site of Haynes’ home. “It was rebuilt as a scale clock tower,” White said. The tower was dedicated Dec. 16, 1978. This isn’t the first time Raleigh’s fallen silent. In 1992, the clock underwent a massive renovation – with repairs to its internal functions as well as the clock face and hands. 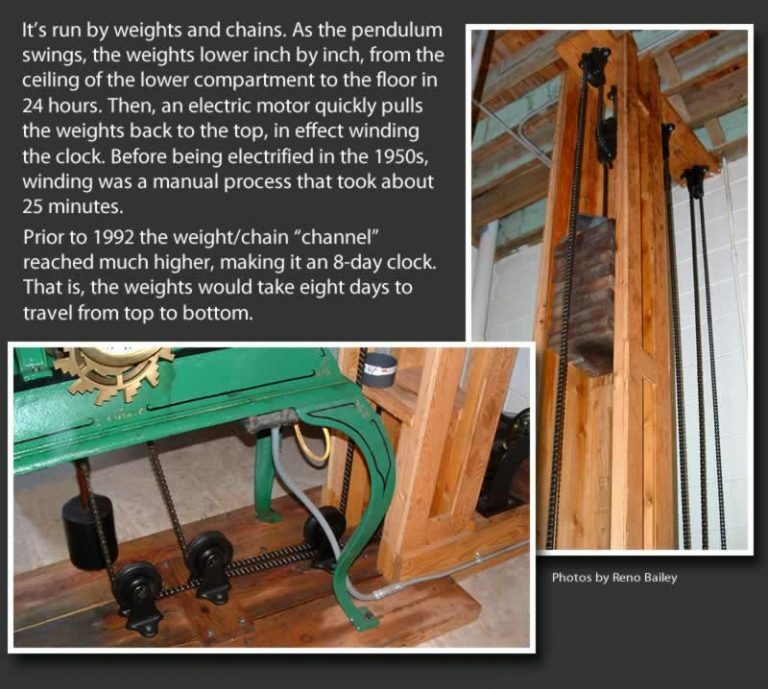 According to a story printed in The Daily Courier Dec. 2, 1992, it was the first major overhaul the clock had ever had. 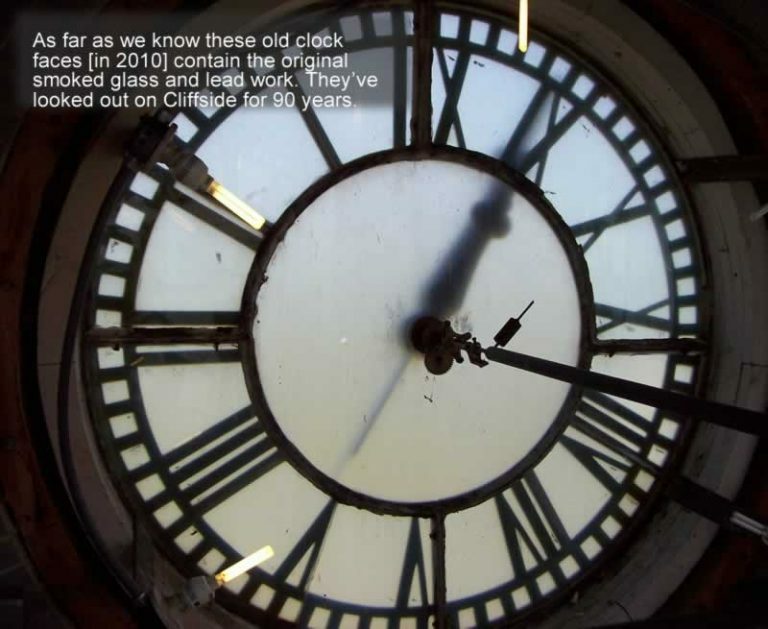 The renovation was done by Jim VanOrsdel, owner of The Clock Shop in Charlotte, who has agreed to again repair the clock when funding is available. Custom built for Cliffside, the clock was made by the E. Howard and Company in Boston. 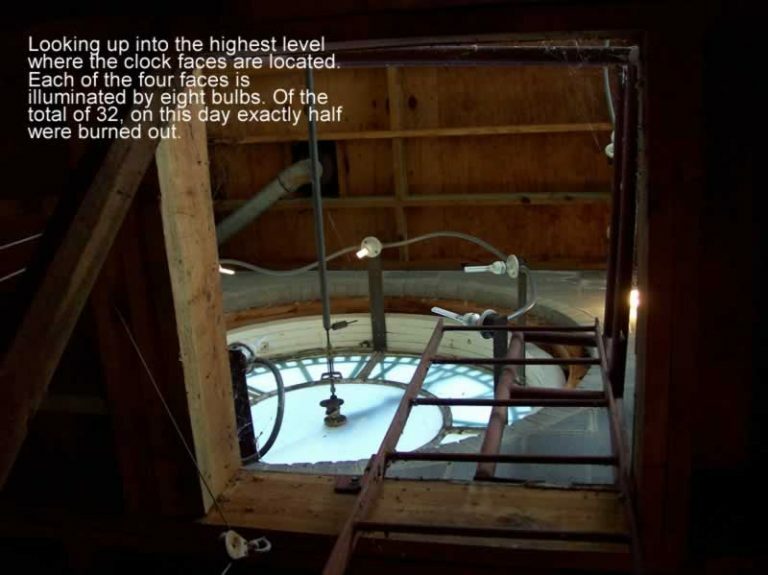 The tower stands at around 40 feet and the four faces of the clock are each five feet in diameter, VanOrsdel said. “The hands are made of cedar wood coated with black spelter,” VanOrsdel said. Spelter is a gritty type of coating that birds don’t like, keeping them off the clocks’ hands, and White pointed out cedar repels insects. The numbers are made of iron. 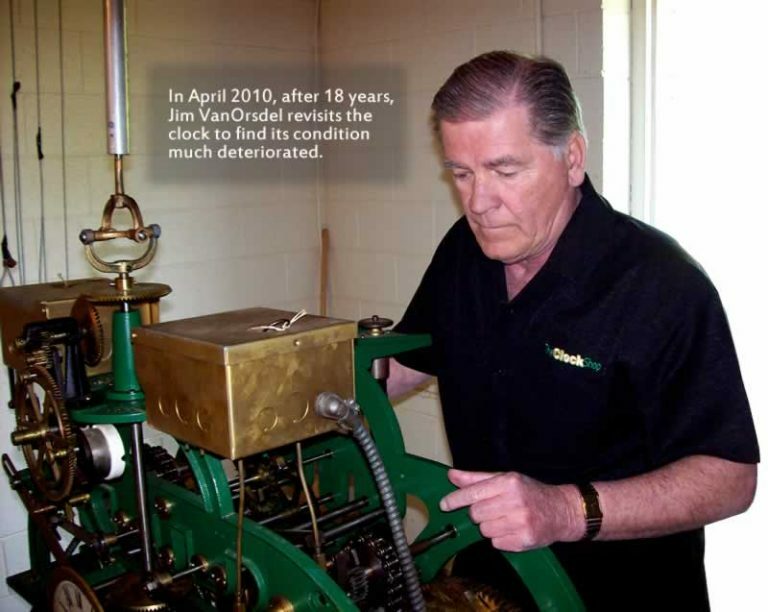 Clock repairman Jim VanOrsdel overhauled the clock in 1992, the first time the clock had been repaired in its 70 years. VanOrsdel will again work on the clock when the funding is available. 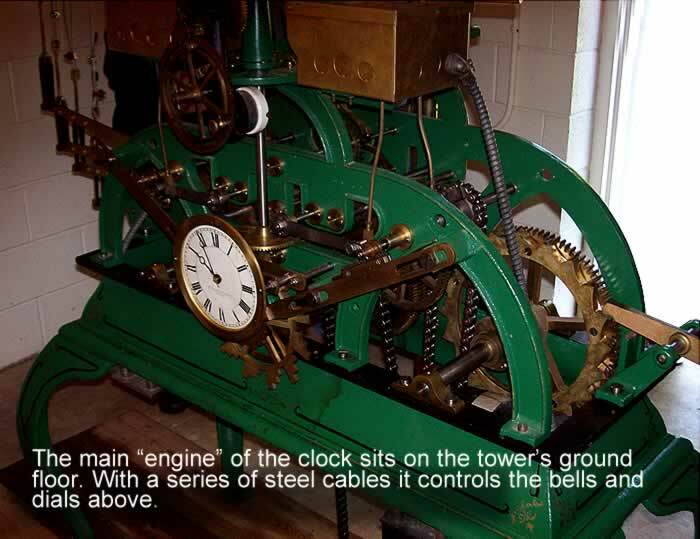 Because it is a Westminster Chime (bells above), it is more rare than other tower clocks. 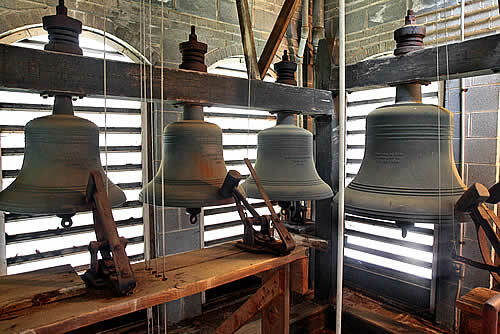 Each bell bears a stamp with the manufacturer’s name, Meneely Bell Co. of Troy, N.Y., The largest bell (at right) was placed in memory of R.R. Haynes, founder of the town and of Cliffside Mills, which was later bought by Cone Mills Corporation. 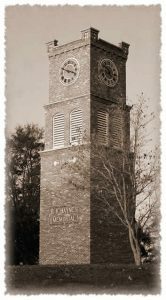 The clock tower stands on the former site of Haynes’ home and was dedicated Dec. 16, 1978. The clock has Westminster chimes, which VanOrsdel said is not common, and when working properly, ring out every quarter hour. Most clock towers were located at the center of the community, VanOrsdel said, just like in Cliffside. And because people couldn’t afford watches or clocks years ago, town clocks served as means for those who lived in the communities to know the time. Swing said the clock has garnered the attention of those passing through, who would stop and walk around the tower and read the plaques at the site. “And people on Cliffside Day have gathered here,” she said. Swing said that from a family, community and a historical perspective, it’s one of the county’s most valuable artifacts. Rutherford County historian and historical society ex officio member Robin Lattimore agreed. “It is one of architectural treasures and historic sites,” Lattimore said. The clock will be included on a list of the 20 most important historic sites in the county he is currently compiling. “We live in an age when what is built does not have the craftsmanship—not that type of investment would be made today,” he said. Seventy to 80 years is about the life of a tower clock before major repairs are needed, VanOrsdel said. 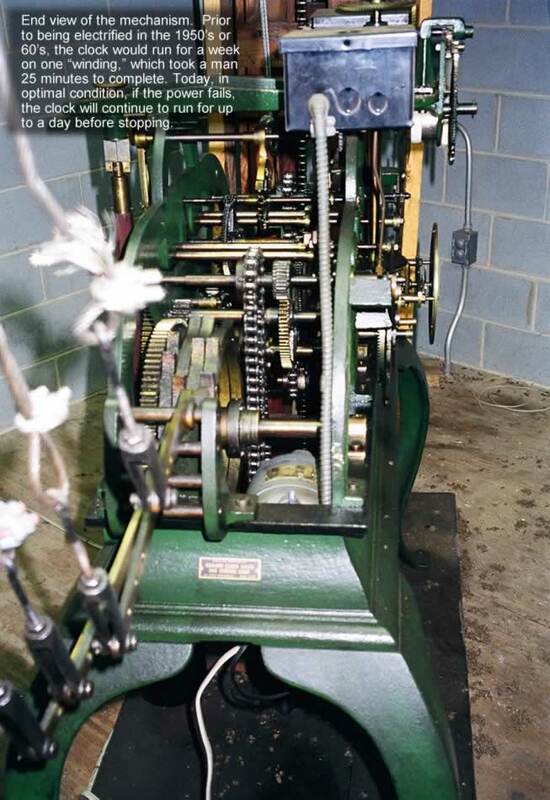 In 1992 when the clock was overhauled, that was the case as well. “For whatever reason, though, it couldn’t be taken care of or maintained,” he said. The renovation took around five months to complete, and VanOrsdel had to take the inner workings of the clock back to his shop in Charlotte. This time, he said, it would likely only take around a month and a half and most repairs will be done on site. Once back in “tick tock” shape, the clock, if maintained, could run indefinitely. 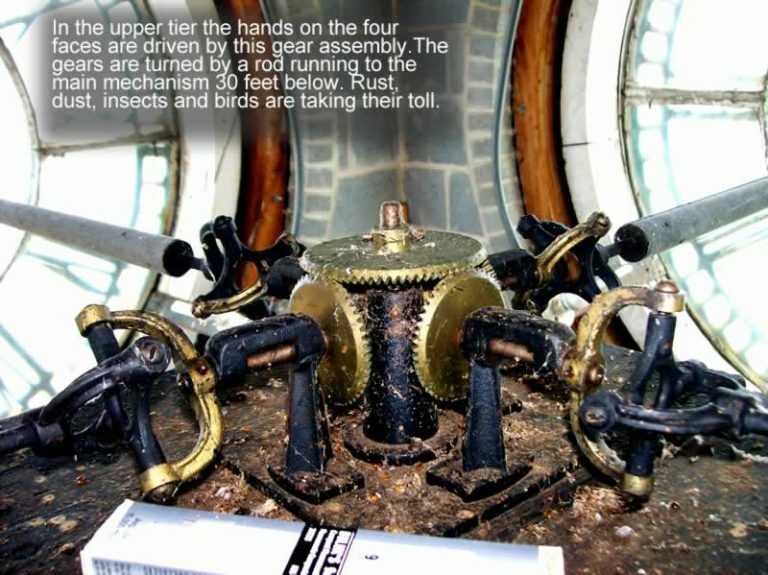 Other than putting the clock back in time, the internal workings are still in much the same shape as the earlier repairs. VanOrsdel said there are a lot of memories attached to the clock for not only the community, but for him as well. “This is a mechanical artifact -it has a little more solidity than a plot of land,” he said. Lattimore said he hoped there would be a way to secure resources to keep the clock functioning for years to come. White said that is in the works for the society. “We hope to set up a fund for it,” he said. Tax-deductible donations to help with the cost of repairs can be made online at www.remembercliffside.com or by mailing donations to the Cliffside Historical Society, 10612 Round Rock Road, Charlotte, NC 28277. 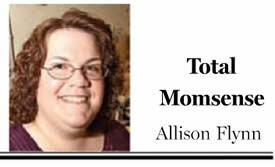 This story appeared in the Courier on Thursday, June 16, 2010. How fitting I learned the words to this song as a student at Cliffside Elementary School so many years ago, and now, as an adult, I am writing about the heartbeat of Cliffside today—the town clock. The clock has been a fixture in this small town since 1922, and moved to its new home inside the 40-foot tower in the mid-70s. And in the mid-80s, yours truly visited it several times as a student at Cliffside Elementary School. Returning to the clock last week brought back memories of those days, and of more recent times I’ve made the trek up the Main Street in Cliffside. 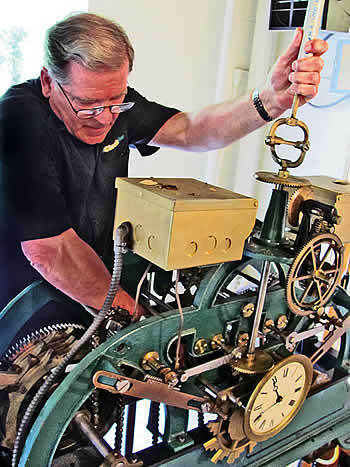 Former Cliffside School Principal Philip White met me and photographer Garrett Byers at the clock to show us the real treasure—the mechanics that make the clock go, but that have been out of time for the past five years, rendering the bells silent. White may not have the official title of town historian for Cliffside, but in my eyes he’s pretty darn close. He shared with us the back story of the town, from its founding by R.R. Haynes, in whose memory the clock was erected years earlier, and of the textile industry that came shuddering to a stop in more recent times. Because you can’t have the story of the clock without knowing why its there in the first place. And if there’s anything I know about Cliffside—after all, my family is part of the town’s heritage—it’s that roots run deep. R.R. Haynes’ great-granddaughter Janice Swing also met us at the clock. Swing has always lived in Cliffside and at one time lived in the house that R.R. Haynes built—land that is now where the clock stands.